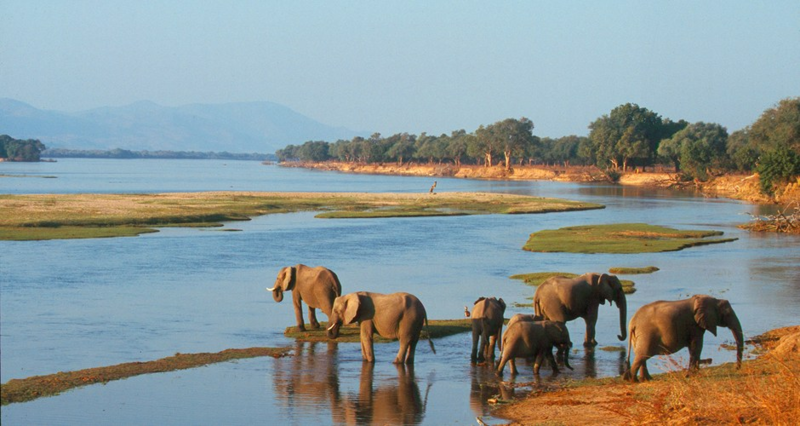 Africa, with its vast expanse of savannah jungles and crystal-clear rivers, and sandy dunes studded with springs, and starry nights, is already a lover’s paradise, and a traveler’s haven. African safaris are descriptions of plunging into the wilderness, the wild surrounding you, engulfing you in its bosom. Lodging while in a Safari, is well provided by the African tourism- you have a wide and overwhelming range of choices- from concrete lodges to tents in the open to camps in the bushes with the firewood burning by. A recent concept invented by the tourism industry aims at targeting the tourist’s experience, and heightening the elation ten folds. – Star beds. Star beds are essentially luxurious beds, decked with linen and pillows, curtained by mosquito netting, and lit by kerosene lamps, set at a vantage point overlooking the vastness of the forest or the lake. 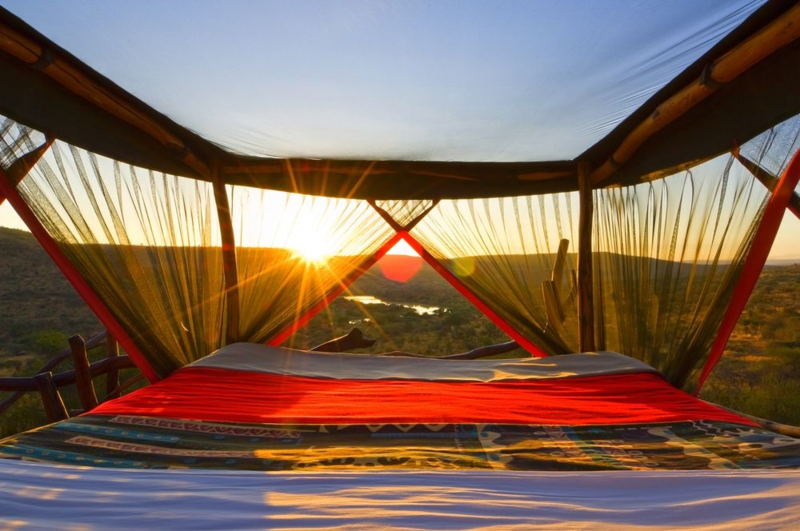 Your canopy for the night would be the 10 million twinkling stars, and your lullaby would be the faint night song of the jungle, to lull you into a dreamy sleep. 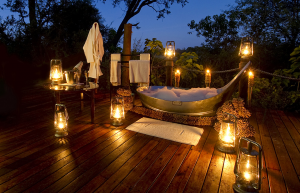 We take a look at the 10 most romantic star beds that Africa has in its goodie bag. 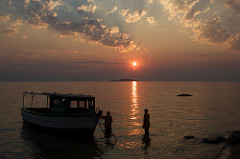 Called the Lake of the stars, Lake Malawi is freshwater lake 72 miles from Malawi city. Flanked by a shimmering jungle, the only local companions you would have are the local fishermen. Activities like kitesurfing, sailing, and waterskiing, and the best freshwater diving on the planet are at your service to pass the day, along with discovering the surrounding jungles. Quite a few tourism organizations have set shop at the private beaches around the lake, each one just as good, and each one giving you a place in the paradise, and memories to keep. Sanctuary Baines Camp is the smallest camp in the Okavango Delta, and also the most exclusive. It has only 5 suites to boast about, each suite surrounded by delicate, comfortable papyrus beds with wheels. Each suite is furnished with a private deck, and the guest is at liberty to wheel out the bed onto the open deck, and spend the night beneath the coolness of the night, with stars and songs of the night. The Baines camp also provides you with your own outdoor bathing pool or a star bath, as it is called – for those nightly rendezvous and skinny dipping into a bubble bath beneath the stars. 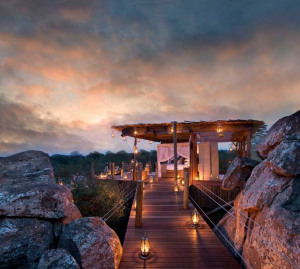 These set of star beds are located in Tswalu Kalahari, South Africa.With 100,000 hectares surrounding the region, and the immense Kalahari night sky enveloping the beds, it is nothing less than romanticing and spectacular to spend a night at Tswalu’s Malori Sleepout Deck. The king size bed decked in the most comfortable of linens is set on a raised platform. Full bathroom facilities are just a short distance from the deck, the path lit by a thousand sparkling lamps. The scenic views of the vast plains and incredible Kalahari sunset are a sight to binge upon, along with the delicious bush meals cooked by your own private cook. 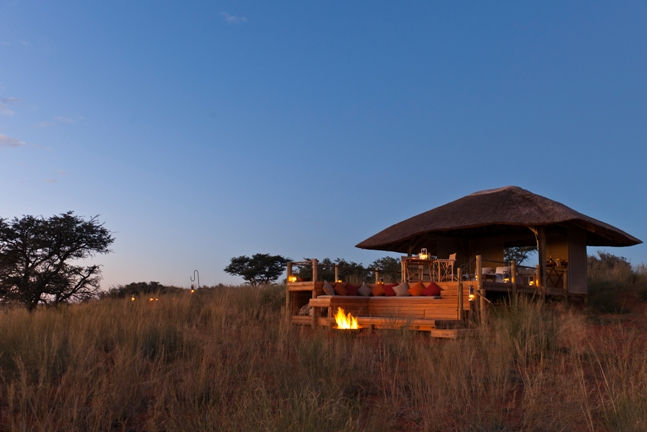 Tswalu also provides camping beds for children, to indulge you in your luxurious family affair. The azure blue waters and fine white soft sands are hosts to many a luxurious villas and resorts, decked on the two beaches. 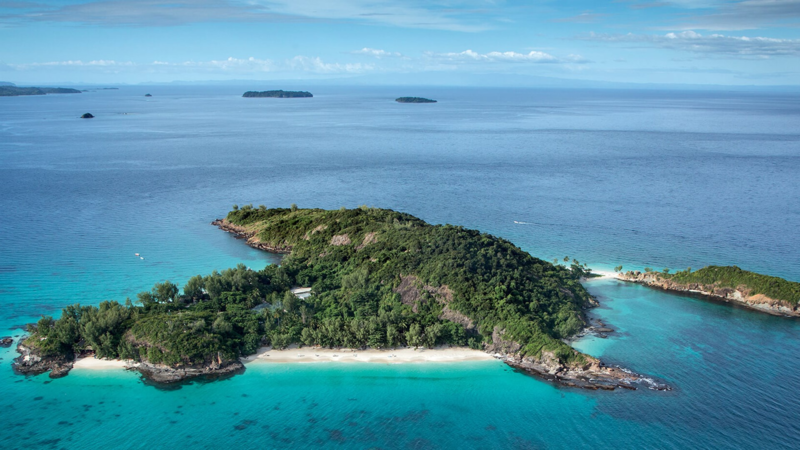 house a chic resort with luxuriously appointed villas strung across two perfect beaches. Snorkeling, swimming the pristine coral reefs or diving to encounter a host of sea creatures like turtles, jackfish, crocodile, scorpion and balloon fish, grey sharks, are all the activities laid out for you to spend your day with. 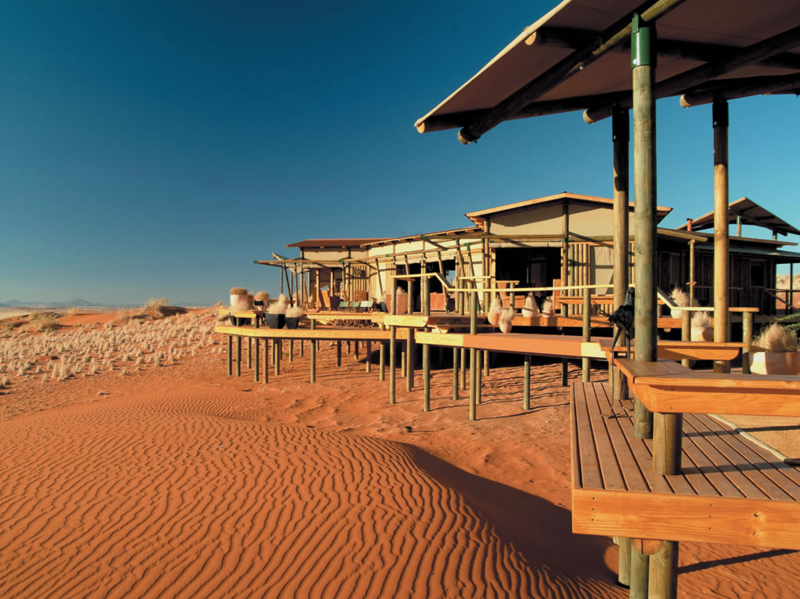 Wolwedans is a desert camp in Namibia, having a breathtaking desert scenery as its backdrop. 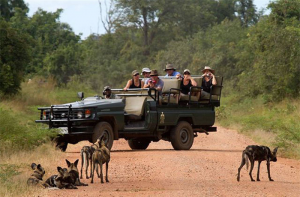 It gives you a pristine, wild environment, with sightings of many animals like the oryx and springbok, jackal, aardwolf, and 170 species of birds. The Mountain View Suite lets you sleep out one night in the desert. In summers, the star beds are put out on private verandahs. Situated in the Mana Pools National Park, Zimbabwe this camp is placed atop a raised parapet overlooking the forest. The region it overlooks is known for various animals that hang out there in the dead of the night -elephant, buffalo, zebra, and even Lions and leopards, promising you a thrilling night under the stars. 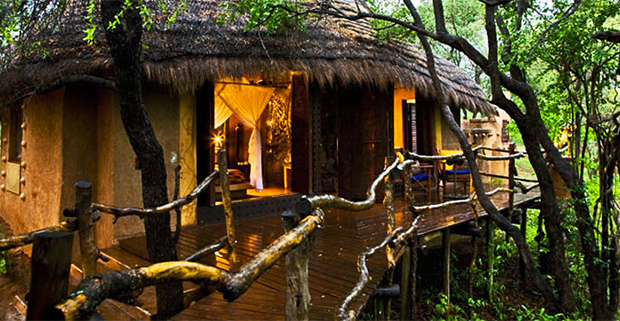 The tree houses in Lion Sands, South Africa, are the most impressive treehouses among those found anywhere else.They are loaded with comfort too- each is equipped with a full bathroom, boasts the best views of the African Savannah, and doesn’t compromise on comforts. It also has an in-house radio to communicate with the field guide. The Loisaba star beds in Kenya comprise of two locations the Kibobo- set among a kopje of rocks and overlooks a waterhole, and the Koija -cantilevered over the flowing waters of the Ewaso N’giro River. The star beds are equipped with full bathroom and shower facilities, and meals are prepared on site. This star bed is situated in Luangwa, Zambia, and is a slightly different type of star bed. For the adventurous of the lot, this safari is a night under the stars armed with only a roll-on mat and a mosquito net. The tourists set to the campsite on foot mid-afternoon with a guide and the roll-on beds, and scout the dry Luwi riverbed to find a spot to camp for the night. Situated in the Sahara Desert, Morocco, this camp isn’t a treehouse, nor asleep out star bed, but it is considered to be one of the best sleepouts in Africa. One of the best places to view the vastness of the starry night sky without any obstruction or light pollution is the Sahara Desert. 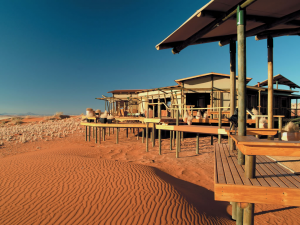 The guests enjoy a traditional Berber dinner, live entertainment, and music under the never-ending night sky of twinkling lights each night, and the morning treat is an exhilarating experience of seeing the crimson sun rising over the dunes.